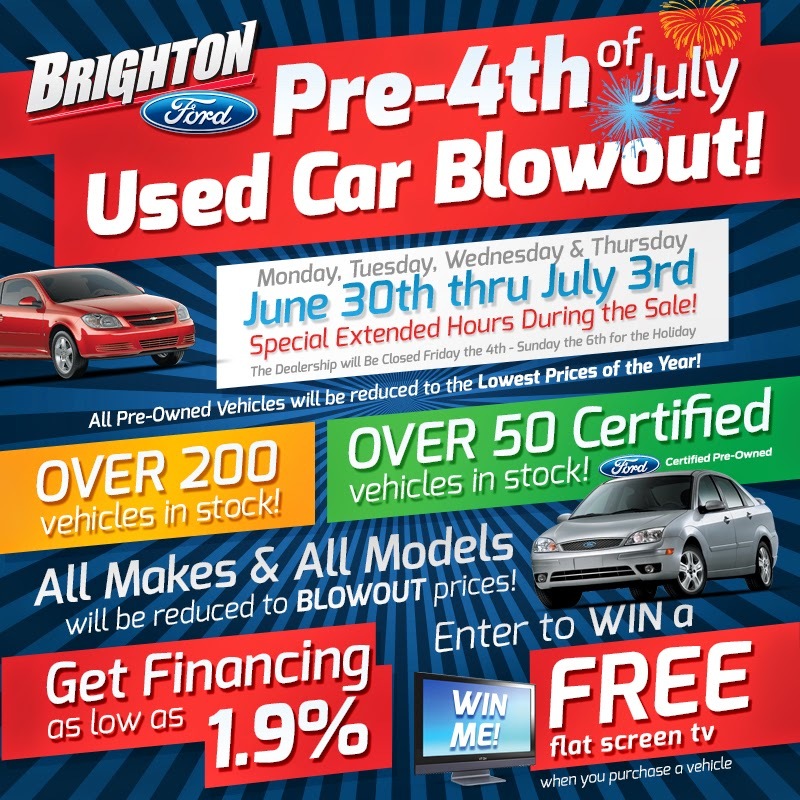 Brighton Ford : Brighton Ford's Pre-4th of July Used Car Blowout! BRIGHTON, Mich - Get ready for some MASSIVE savings at Brighton Ford's Pre-4th of July Used Car Blowout! Starting Monday, June 30th until Thursday, July 3rd we are extending our hours and offering you the LOWEST prices of the year on all pre-owned vehicles. All makes and models will be reduced to BLOWOUT prices and customers can receive financing as low as 1.9%. Brighton Ford's Pre-4th of July Used Car Blowout will not only keep money in your pocket, but also give you the chance to walk away with a FREE flat screen TV! When you purchase a vehicle at our Blowout Sale, you are automatically entered to win a brand-new flat screen television. We hope you take advantage of all of the great deals at our Pre-4th of July Blowout starting Monday, June 30th through Thursday, July 3rd! You will see the lowest prices of the year on all pre-owned vehicles! Questions? Feel free to give us a call at (800) 836-8206. Brighton Ford will be closed on Friday the 4th through Sunday the 6th for the holiday. Brighton Ford is located at 8240 Grand River Ave. just north of I-96 in Brighton. We are a family owned and operated business that strives for customer satisfaction. For more information on Brighton Ford visit BrightonFord.com or give us a call at (800) 836-8206.